Committees of Correspondence for Democracy and Socialism began in 1991 when approximately one third of the Communist Party USA membership split from the party to form a new organization. 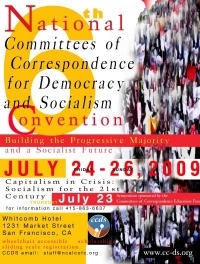 In 2000, Committees of Correspondence (CoC or CofC) became Committees of Correspondence for Democracy and Socialism (CCDS). Our members are activists in all the social movements of our country -- of labor, civil rights, immigrants rights, women, peace, international solidarity, gay and lesbian rights, environment, youth and students, seniors, and religion. We have come together to help shape a clear cut alternative to the destructive, mean-spirited corporate drive for profit above all else." We seek constructive solutions to the problems of poverty and unemployment, racism, sexism, health, education and housing. Join us. CoC held its first conference in Berkeley, California, July 17-19, 1992. Charlene Mitchell, who had been a leader of the California Communist Party USA, spoke at the conference and describedits origin. She said, "In December 1991, barely half a year ago, a number of members of the Communist Party met in the now notorious Room 211. What began as a moment to take stock and ponder where to go from there has now become a very different entity. Bill Gallegos Los Angeles, Chicano, writer, educator, community activist. Marshall Garcia New York, Cuban American, exec vice president Local 1199. Gina Garro Massachusetts, white, youth worker, Youth Caucus nominee. John Gibson Los Angeles, white, trade unionist. Sidney Gluck New York, white, economist. Yvonne Golden San Francisco, African American, former school principal, peace and justice activist. Marian Gordon Los Angeles, white, political activist. Dan Halper Mill Valley California, white. Pat Harris New York, African American, 1199 Vice president. Erin Libson Philadelphia, white, male, UE shop steward. Ray Markey New York, white, President AFSCME local 1930. Doris Marquit Minneapolis, white, Womens Studies teacher, Women's International League for Peace & Freedom activist. Racial designations in original document. In 1993 Committees of Correspondence was an endorser/sponsor of the Midwest Radical Scholars & Activists Conference. The theme of the conference was, "Popular Empowerment in the Clinton Era". The conference was held between Oct. 29 - 30, 1993 at Loyola University, Chicago. The anti-communist newsletter of the Christian Anti-Communist Crusade reprinted a May 1993 fundraising letter by a group of COC members in which they summarized their policies including a "single payer health care" program. The full text of this letter is reproduced below. The CACC issue was presumably in May or June 1993. "Last July, we signers of this letter came together with more than 1,300 others in Berkeley, California, for a conference to explore "Perspectives for Democracy and Socialism in the 90's." We were all tremendously excited and encouraged by the newness and the enthusiam generated by hundreds of people seeking a way to work together." "The conference participants adopted a Declaration of Principles that declared, "We are motivated by the profound conviction that our country needs a humane alternative to the anti-human system of capitalism." "The Committees of Correspondence has set for itself the goal of a founding convention in 1994 that will be like no other. The delegates will represent the thinking, writing and activity of its members over a period of two years. The members will have participated -- together with others == in every step of the process. The character and role of the new organization will be the result of an extraordinary democratic procedure." "We signers of this letter are very proud to be part of this process. We, like everyone involved, are discovering new ways of debate, of reaching for answers, of developing strategy and tactics of struggle. We invite you to join us." "However, this process requires your financial support. Your generous contribution will help to make possible the ongoing work of the organization while continuing to develop. You can make the difference in the quality and quantity of what we accomplish over this next year." "as you can imagine, the Committees of Correspondence will not receive corporate or government grants. Every contribution from you and others becomes the underpinnings of our budget. We ask that you give as much as you can as soon as you can. "As we write this letter, members of the (CoC) are engaged with others in major democratic struggles for single payer health care, for jobs, for equality and against racism in all it forms. We are engaged in the efforts to life the criminal U.S. embargo against Cuba. We see these struggles as inseparable from the path to a socialist U.S.A."
"We know that you mut make choices as to where to give your important financial contributions. We think your gift to the Committees of Correspondence will profoundly contribute to the strength of the left in our country." "This is a national fund raising endeavor. Each area has set a goal for its contribution, and all monies you contribute will be credited to your area. So please give as generously as you can. Thank you." CoC held its second National Convention at New York, on July 12-14 1996. According the COC website (2004), they established a service in October 2002 which "is a news, discussion and debate service of the Committee of Correspondence for Democracy and Socialism. It aims to provide varied material of interest to people on the left -- things that will help them to interpret the world, and to change it." Furthermore: "Portside is an alternative medium of communication. It is noncommerical, It is dedicated to advancing the cause of peace and social and economic justice and racial equality. The folks running this project all think we can do better than capitalism -- and had better do better, if we're going to have a future -- without having a neat blueprint for the future or a well-drawn roadmap to it." "Portside is run by seven moderators, one for each day of the week." Click here for the KeyWiki article on the 1992 National Convention. Committees of Correspondence National Conference and Convention, July 25-28, 2002 San Francisco State University. The Meaning of Durban  Where Do We Go From Here? Plenary Panel and Discussion on Economic Justice and Globalization. Kenneth Riley, David Bacon,, Marilyn Albert, Renee Saucedo, Angela Sambrano, Cathi Tactaquin, Marty Price, Patrice Sewell, Joan Cohen, Claire Carsman, James Campbell, Peter Orris, Thelma Correll, Edith Pollach, Amaha Kassa, Harry Targ, Steve Williams, Karen Talbot, Mort Frank, David Cohen. Plenary Panel and Discussion on Electoral Reform and the Struggle for Democracy. Plenary Panel and Discussion on War, Peace and Democracy Elaine Hagopian, Leslie Cagan, Rhonda Ramiro, Angela Davis September 11 and Bush's war on terrorism. Response to increased militarism, Ashcroft's attack on civil liberties, the role of the United Nations and other international bodies. Afternoon Plenary on HIP HOP Culture Mael Apollon Faye Moore, Jess Acostia Hip Hop as part of the culture of the young generation and what it is all about. 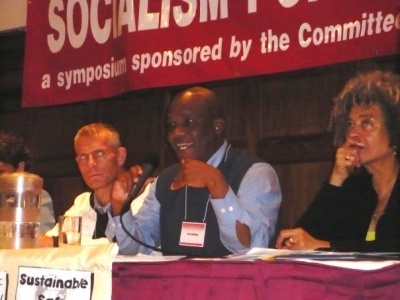 The Committees of Correspondence for Democracy and Socialism-(CCDS) worked with Barack Obama in Chicago through the New Party, the Alice Palmer campaign and the anti Iraq War movement-particularly CCDS members Timuel Black and Carl Davidson. CCDS leader Manning Marable, writing in the December 2008 issue of British Trotskyist journal, explained Obama's relationship to the Chicago left. Carl Davidson was a key founder of Progressives for Obama and serves as the organization's webmaster. Timuel Black's wife Zenobia Johnson-Black is a Progressives for Obama endorseras are several CCDS leaders including James Campbell, Barry Cohen, Jay Schaffner, Harry Targ and Mildred Williamson. Shortly before the November 2008 election CCDS issued a statement "A Critical Moment-a message to CCDS membership"calling for a major effort to defeat the Republicans and elect obama. With less than three months remaining before the November 4th general election, CCDS members together with all left and progressive forces are urged to work wholeheartedly to ensure a massive defeat at the polls for John McCain and his war-mongering, neo-conservative, right-wing sponsors. Only a massive turnout of new, young, African American, Latino, Asian American, trade union, and progressive voters casting a ballot for Barack Obama can insure this defeat. We must find ways to argue the stakes inherent in a McCain win on key issues: ending the war, the faltering economy, creating “green” jobs, a sustainable environment, universal health care, and restoring the right to organize unions. The various smears, racism and fear mongering surrounding the first viable African American presidential candidacy are making inroads among large segments of the public. CCDS members have a role to play in challenging the racism, joining with broad efforts like that of the petition campaign against Fox TV’s racist characterizations of the Obamas organized by the Color of Change. Hip hop artist, Das and 150 others delivered 620,000 signatures to Fox TV’s studios in Manhattan in July. It is important to find ways to pressure the Obama campaign from an independent platform, and resist efforts to demoralize, sidetrack, and divide the movement to elect Obama. Progressives For Obama (P4O) is one such vehicle. It emerged in March 2008 during the primary campaign and has become a viable voice of critical support from the left, aiming to countervail the growing right-wing pressures on the Obama campaign. We urgently ask CCDS members to link up with local campaigns and organizations like Progressives for Obama (P4O) to infuse the election campaign with the issues that matter most – and making the campaign at the base a deeply progressive project. The NEC, at its most recent meeting, discussed issuing a message urging members in local areas to help build Progressives for Obama. At the launch of P4O, a draft call was issued by Tom Hayden, Bill Fletcher, Barbara Ehrenreich, and Danny Glover. Carl Davidson, a member of the NCC of CCDS, is a key organizer and moderator of the P4O web blog. The list of endorsers has grown impressively to include leaders of labor, peace and justice organizations, and leading progressive individuals. Carl Davidson added his own addendum to the message, urging CCDS members to work with Tent State, Progressives for Obama, Progressive Democrats of America, United for Peace and Justice and The Nation magazine. Work locally to expand the electorate in a younger, more progressive direction. Register new voters, and work with other groups, including the young people around the Obama campaign. If it's a normal election, McCain can win. If it's not, and turnout is new and different, we have a good shot. It really boils down to that. Hook all this up with a local progressive blog or two or three, or start one yourself...Be a public face, then link to others across the country and with us nationally. This is the scaffolding of a national network. If you're up for adventure, come to Denver for the Democratic National Convention. Hook up with Tent State, P4O, PDA, UFPJ and the Nation Magazine. We’ll put you to work! CCDS members have a lot to contribute as an independent force committed to advance the fight for peace and for a massive jobs program in this year’s crucial elections. From this perspective we urge members to consider joining and or supporting Progressives for Obama with our ideas, activism and financial support. For those members and friends who are supporting other independent candidates, we urge that we go forward together to register new voters, fight hard on the issues and lay the groundwork for expanding and consolidating the progressive majority. What are the best ways to unite the progressive majority in our country around a depression-busting platform for peace, democracy, and justice? How do we do it in ways that both clarifies the vision and strengthens the components of socialism for the 21st century? These were among the key questions 255 activists wrestled with for four days at a public Symposium followed by the 6th National Convention of the Committees of Correspondence for Democracy and Socialism (CCDS) at San Francisco's Whitcomb Hotel July 23-26. Judging from the enthusiasm and solidarity expressed during the many plenary sessions and workshops under the banner of "Building the Progressive Majority and a Socialist Future," participants found a few solid answers and a fired-up fresh start on a new round of organizing in the period ahead. A day long symposium around the theme "Capitalism in Crisis: Socialism for the 21st Century," sponsored by the Committees of Correspondence Education Fund opened the 4 days of programs on July 23rd. Gus Newport, former mayor of Berkeley, opened the panel on "Building the Progressive Majority in the Age of Obama" by introducing a Jack O'Dell authored Democracy Charter. The charter is modeled on both the 1955 Declaration of the Bandung Conference against colonialism and the Freedom Charter proclaimed by the anti-apartheid forces in South Africa the same year. It outlines thirteen points for a "Second Reconstruction" in the U.S. of far-reaching and all-sided democratic reform - politically, socially, economically, and culturally. "At the very heart of the unfolding struggle for democracy today," says the Democracy Charter, "are the issues of race, class, and gender in relation to power and decision-making. This has been a fundamental reality since the birth of this Republic." Since its founding, the U.S. has "rested upon four pillars" - the genocide of Native Americans and the seizure of their lands, the enslavement of Africans and "affirmative action" for slave owners, the military seizure and annexation of one-third of Mexico, and "the exploitation of a wage-labor of the working class among the new immigrant population. The panel featured responses to the "Democracy Charter" by Bill Fletcher Jr, editor of Black Commentator, Michael Eisenscher of US Labor Against the War, Jacqueline Cabasso from Western States Legal Foundation, Frank del Campo from the Labor Council for Latin American Advancement and Steve Williams of POWER. Bill Fletcher Jr cast the Charter as a political and social guide for mass struggle. "If we just look at these 13 points as a laundry list that needs additions or sharper definitions...we're missing a key feature. What Jack O'Dell has done here is deliver a polemic against postmodernism, the whole trendy effort to deny the importance of strategic aims, to consign our efforts to private and disconnected stories. He reaffirms the rootedness of our unity and our common goals, here and internationally." Left unity A recurring theme throughout the four days was "left unity." This was evident in the lineup of speakers for the Symposium roundtable conversation on "Building the Left and the Progressive Majority." In addition to CCDS leader Mildred Williamson, the panel included Judith LeBlanc of the Communist Party USA, Joe Schwartz of Democratic Socialists of America, Michael Rubin of Solidarity, Jamala Rogers of Freedom Road Socialist Organization, and Linda Burnham. The panelists discussed the importance of building the left within the current upsurge, working for left unity in struggle against the right, and the tactical issues that arise in uniting the progressive majority. The Symposium ended with "Building Socialism in the 21st Century - An International Evening." Angela Davis moderated by stressing the importance of international solidarity in winning her own freedom in the US. Eric Mar, recently elected to the San Francisco Board of Supervisors, welcomed everyone and presented a resolution from the Board of Supervisors in tribute to the work of the Committees of Correspondence for Democracy and Socialism. International guests included Chris Matlhako from the South African Communist Party and Marcos Garcia from the Venezuelan Embassy in DC gave a picture of protracted battles against neo-liberalism and their efforts to build and maintain unity on the left in their countries. Helmut Scholz, a leader of Die Linke (The Left Party) of Germany, described the unity efforts between groups in East and West Germany that brought together its forerunner, the Party of Democratic Socialism, made up of the former East German Communists, and groupings of Left Social Democrats from the West. Their common task now, he explained, was making sure the burden of the capitalist crisis was not placed on the working class. Jackeline Rivera, an FMLN deputy to the legislature of El Salvador, was warmly received. She revealed how, in their recent electoral victory, the FMLN saw two left groups break away, and the national unity efforts that followed. Solidarity messages to CCDS were read ot from Cuba and Vietnam and "The Internationale" was sung. At Saturday morning breakfast Helmut Scholz of Die Linke was joined by Communist Party of France leader Daniel Cirera in stressing the importance of the working class response to the economic crisis in Europe. "Most of all...we must remember that this is a political crisis. To be sure, its economic impact is severe, but I don't think the capitalists are without a way out. The question is who will pay for it, where will the burden be placed, and that is a matter of political will and mass struggle." Delegations arrived from the coal regions and river towns of Kentucky, from the rustbelt mill towns of Western PA and Ohio, from the heartland of central Indiana, Chicago and Detroit, from the Carolinas, Mississippi, Alabama, and Virginia in the Deep South, as well as New York City, and New England. Many are leaders in the African American community and most of the major trade unions. Women were on a par with men, and it was clear that CCDS was an organization with deep roots in the working class and many of the key social movements of today. A few fresher, younger faces, attending a gathering like this for the first time, offered a toe-hold for future connections and growth. Obama's election and the movement around it...underscored the inseparable connection of issues and constituencies in the progressive majority rooted in race, class, and gender. The backbone of that majority is the combined force of the working class, communities of color, women, and youth. Articulation of the needs and demands of those constituencies in the first place is essential to advancing and consolidating the progressive majority. CCDS isstill part of the ongoing alliance of pro-Obama forces at the grassroots; now we have the further task of maintaining unity against the far right in both the 2010 and 2012 elections. We had our own independent views to advance. The deep crisis of capitalism was not going to be solved in any fundamental way by the neo-Keynesians on Team Obama, even as we supported some of their initiatives, such as green jobs." "We have two sets of tasks...our mass democratic tasks and our socialist tasks. They are interconnected, but they are not the same. At the same time, we have to advance both of them well for both to thrive." Our socialist tasks required more serious intellectual work to rescue socialism from its crisis in the last century and bring it into the present as a renewed force. This meant engaging the most advanced fighters in a process of revolutionary education and study groups, to intimately connect this work with a practice learned from working class struggle. It also meant think tanks to develop serious policy proposals on a range of structural reforms that could both engage the crisis and serve as bridges pointing to a socialist future. Finally, these tasks were not for us alone, but required collaboration with other socialist and left organizations. Other suggested changes dealt with strengthening arguments on climate change, adding a section on immigrants rights, clarifying the nature of civil and human rights generally, and questioning aspects of the nature of markets under socialism. According to Davidson-the orientation on socialism in the document will distinguish CCDS in a number of ways. First, it places the organization within the wider trend of "21st Century" socialism arising in Latin America, Europe and elsewhere. Second it places winning the battle for democracy at the center of the transition to socialism and socialist construction, especially equality for women and among nationalities. Third, it affirms a pragmatic orientation toward both markets and planning in the 'mixed economy' characteristic of a transitional society. Fourth, it insists that 'Eco-Socialism' and the transition to a green energy economy is by far the best approach for any socialism in the coming period of climate change. Finally, it sticks to the organization's long standing tradition of socialist internationalism. One new section deals with the importance of the "solidarity economy," such as worker and community cooperatives. These were discussed both as important structural reforms under the existing order, as well as features of a new socialism. This point serves to distinguish the CCDS as an ally of the worldwide solidarity economy movement, and a wave of new worker and green cooperatives in the U.S.
Third party versus the Obama Alliance CCDS's attitude toward organizing a new third party, which was also more prominent in the founding statement, was debated. CCDS has a long-standing "inside/outside" policy on electoral work, which has only been defined in a general way. For a large majority of the organization, this meant working to get Obama elected in various ways. Some worked within the Democratic Party organization and others worked for Obama in independent organizations. A number of CCDSers were opposed to any Democrat and worked for Cynthia McKinney in the Green Party or the Peace and Freedom Party in California. Still others worked for the Working Families Party in New York where, because of its more progressive election laws, they could vote for Obama on the WFP ticket. Judging from the positive reports from the delegates' experiences with the election, as well as the documents and resolutions passed, it's clear most of the organization will be engaged in the Obama alliance, although from an independent and critical position. For those members deeply connected with the labor movement and the movements of oppressed minority communities, most will work on strengthening the left-progressive pole within the Democratic Party at the base. This will heighten the struggle against the "Blue Dog" Democrats and others collaborating with the unreconstructed GOP neoliberals. Strategically, this position is consistent with preparing the conditions for supplanting the Democrats with a popular and working-class alternative, although not always viewed as such by third party proponents. But it's also clear that the prospects for such a breakaway and wider alliance are not imminent. "We have our platform and Obama has his," said one delegate, summing up. "They overlap, but they're not the same. We support him where he's right and we oppose and pressure him where he's wrong--and we certainly defend him against the racist assaults from the far right." Panels and Workshops The "Building the Progressive Majority: Race, Class and Gender" plenary discussion began a series of panel and workshop discussions. The plenary panel consisted of reports highlighting work of CCDS activists in the South, in the Heartland "rustbelt states," on the West Coast and New England and the East Coast. A Randy Shannon report on Western Pennsylvania described independent political work with groups like Progressive Democrats of America in raising the consciousness and unity of the working class and Black community and then to ally with forces like the Congressional Progressive Caucus to defeat the right and advance progressive planks in Obama's economic package. Zach Robinson and Shafeah M'Balia reported on work in the South, and the special role played by democratic forces opposed to the right wing. They highlighted a multi-racial, grass roots people's charter movement initiated by the NAACP in North Carolina that parallels the "Democracy Charter" and mobilized thousands to march on the capital in Raleigh earlier this year. Paul Shannon of the American Friends Service Committee AFSC reported on the Boston Majority Agenda Project, a coalition effort to develop a call and action program for the progressive majority in Boston. Karl Kramer discussed the immigrant rights movement and its interconnection to the battle against racism and for workers rights in the Bay Area. The question of undocumented workers' impact on the labor and social movements was the most discussed issue following this panel. A key issues addressedwas the struggle of U.S. workers against global neo-liberal policies of capital- the right to organize and defend against union busting, union democracy, the plight of undocumented workers, and the need for broad forms of struggle by workers such as working people's assemblies, unemployed councils, and municipal movements. Another workshop dealt with youth and student organizing. Nestor Castillo, a Bay Area solidarity activist chaired, while Pete Sherman of Young Workers United, Camille Williamson of Chicago's Southwest Youth Collaborative, and Keith Joseph of the New Brunswick NJ Democrats for Change made presentations. "It's time to get beyond a protest mode and start posing the question of power," said Joseph. His group in New Jersey, mainly activists fresh from the Obama campaign, had run 50 candidates challenging all the Democratic Party positions in the area, and to the shock of the entrenched old guard, won 23 of them. All the youth stressed the importance of the new multimedia forms of communication and tools for organizing. The workshop on the peace movement and the economy was presented by Michael Eisenscher, Mort Frank of CCDS in Philadelphia and Judith LeBlanc of United for Peace and Justice. Eisenscher paid special attention to the need for labor solidarity between U.S. workers and Iraqi trade unions, while LeBlanc emphasized connecting anti-war campaigns with the economic crisis. Mort Frank did an in-depth analysis of the best ways to propose cuts in the defense budget, stressing the most deadly weapons actually being used. The workshop on socialist education looked at how best to organize a national network of socialist study groups, especially the need to find popular teaching materials for reaching younger audiences. One project proposed was to organize, together with other left groups, a track of socialist panels and workshops at the U.S. Social Forum in Detroit next summer, where more than 10,000 young people are expected. The most contentious workshop was on the CCDS approach to elections. Chaired by Carl Davidson and Jonathan Nack, participants were urged to focus on how their practical work in elections in 2008, whether for Obama or a third party, served to build a progressive majority... " Western Pennsylvania activists argued for taking up building Progressive Democrats of America as an independent formation in the orbit of the Democrats that could wage struggle with both the Republican Party right and the "Blue Dog" Democrats collaborating with the right. A pivotal workshop of the convention was the session on "Developing a Democracy Charter for the South." A large assembly of activists from seven Southern states reported on grass roots work supporting labor efforts to organize, the people's charter and assembly movements, and work around immigrants. The workshop held an in-depth discussion with Janie Campbell, President of the Charleston, SC sanitation workers union, who spoke on behalf of the sanitation workers organizing around issues of health and safety and equal treatment of city employees. The sanitation workers have been protesting harsh working conditions and an unsafe working environment. The workshop authored a resolution supporting the Charleston sanitation workers and a resolution drawing attention to the special role of the South as a base for reactionary militarism and anti-union policies. The workshop recessed and reconvened early on Sunday morning to develop a concrete plan of work to support the Charleston workers. Vietnam reparations campaign Saturday was the evening of solidarity with Vietnam. It featured highlights of the recent CCDS sponsored tour of Vietnam and the ongoing crisis of Agent Orange. Earlier in the day, a documentary film by Clay Claiborne, "Vietnam: American Holocaust" brought all the bitter horrors and memories of those years back to the surface. Claiborne was part of a CCDS Study Tour to Vietnam last year, and after presenting the film to the Vietnamese, they ran it on nationwide television. Co-chaired by Vietnam veteran Paul Cox and Judge Claudia Morcom, the evening was designed to launch a campaign for the U.S. to make reparations to Vietnam for the ongoing impact of the mass poisoning of the population with Agent Orange. Morcom was one of seven international judges on the International People's Tribunal of Conscience in Support of the Vietnamese victims of Agent Orange." The veterans and their families and friends who spoke from the floor were choked with emotion as they offered accounts not only of what they had seen that happened to the Vietnamese, but also to the veterans who were poisoned, and birth defects on their children as well. CCDS joined the campaign by acclamation. New Leadership and Veteran Advisors The closing task of the convention was choosing a new leadership. All four co-leaders Charlene Mitchell, Mark Solomon, James Campbell and Leslie Cagan-longtime leader of United for Peace and Justice, stood down. The outgoing chairs nominated Pat Fry, a labor activist from New York, Carl Bloice, a writer from San Francisco, Renee Carter, a physician from Virginia, and Carl Davidson. The convention also of elected 15 members of a new National Coordinating Committee. Fifteen additional NCC members are elected by direct mail ballot after the convention, a measure designed to give voice to members who cannot attend the convention and to help insure multi-racial and geographic diversity. In the end, four new co-chairs were elected, unopposed. The fifteen new NCC members are Ted Reich, New York, Anne Mitchell, New York, Duncan McFarland, Boston; Mildred Williamson, Chicago, Steve Willett, Oakland, Karl Kramer, San Francisco, Marian Gordon, Los Angeles, Jae Scharlin, Berkeley, Juanita Rodriguez, Portland, Marilyn Albert, Cleveland, Harry Targ, Indiana, Janet Tucker, Lexington, Ira Grupper, Louisville, Zach Robinson, North Carolina, Erica Carter, South Carolina. "I'm very hopeful," declared outgoing co-chair James Campbell. "We have a very good and timely political orientation. We have some very experienced and capable leaders on a number of fronts. And most of all, we have these new younger people coming forward, especially in the South. We're in a position for major growth, especially in view of the terrible situations posed by the crisis. It's time to move!" On Monday, October 12, 2009, David Schwartzman gave a presentation at the Institute for Policy Studies in Washington, DC on the science and politics of catastrophic climate change. The event was sponsored by the Metro DC chapter of Committees of Correspondence for Democracy and Socialism and the DC Metro Science for the People. Renee Carter chaired the meeting which was attended by over 20 mostly activists and representatives of environmental and progressive organizations. After David’s in-depth, but clear explanation of the complex science of both climate change and how the catastrophic results can be prevented, Ted Glick of CCAN spoke about the latest environmental legislation and the organizing of the Chesapeake Climate Action Network, a major environmental group in the Washington area. Walter Teague discussed the political and strategic issues of prevention of C3 and Renee Carter described the political work and approach of CCDS. Valuable contacts both new and renewed were made and the impassioned discussion continued for over two hours. The Committee to Stop FBI Repression lists Committees of Correspondence as one of the organizations that has issued a statement of solidarity in support of the activists raided in the September 24, 2010 FBI Raids. In May 2010, Rep John Conyers introduced a bill entitled "The 21st Century Full Employment and Training Act." The bill was "little noticed at the time but, today, after another 7 months of dismal jobs reports -- we have actually lost ground during 2010, creating fewer jobs than the growth of the labor force -- there was renewed interest in this legislation by a range of progressive groups". The Democratic Socialists of America National Political Committee made mobilization around the Act a national priority; Progressive Democrats of America "is developing a similar effort, as are both the Committees of Correspondence for Democracy and Socialism and the (DSA controlled) National Jobs for All Coalition". In September 2011 CCDS membership had increased incrementally over the past year with 50 new members. This represented a turnaround as membership had been declining prior to June 2010. At the time there are 397 members. Another 118 are 1 year in arrears, 50 more are 2 years in arrears. 1. Become fully engaged with the 'Occupy Wall Street' direct actions and mass mobilizations expanding through hundreds of cities across the country. In addition to working directly with the young people initiating these events, we should work to bring wider allies, such as trade unions and grassroots organizations from communities of color, to add their voices and their strength to this common front aimed at finance capital. In July 2013, at the CCDS National Convention in Pittsburgh, a workshop entitled “Progressive Platform: Elections, Jobs, Taxes” was held, in which Larry Moskowitz of the Left Labor Project made a motion that three swing U.S. House districts be picked into which energy and funding could be pumped to help sway the outcome of the races. This motion passed unanimously, and was forwarded to the body of the Convention as a resolution. Known at the “Progressive Platform Initiative,” this resolution read: “Be it resolved that the NCC consider the possibility of CCDS in combination with other groups or progressive parties initiate a dialog to implement a three-Congressional district electoral strategy—targeting three vulnerable and/or swing districts in which it might be possible to elect progressive Democrats in 2014 by developing an independent campaign around economic justice issues.” The resolution was adopted July 21st, the final day of the Convention. Thus, the basic idea is to partner with like-minded groups to solicit funds, mobilize other forms of support, and energize voters as much as may be feasible relative to these three targeted November 2014 races. Since that time there has been informal as well as formal discussion as to the implementation of the resolution. One place where informal discussion occurred was during the November NCC meeting. Carl Davidson presented a list of approximately 35 U.S. House races where the Republican incumbent was either vulnerable or a progressive candidate had a good shot at election. Also at this meeting it was decided there’d be a more formal discussion in the January meeting, and Jay Jurie was tasked with coordinating that particular agenda item. ↑ America's Survival, Inc. "From Henry Wallace to William Ayers - the Communist and 'Progressive' Movements"